While the rest of the world is basking in Summer, it's the middle of Winter down here in the Southern Hemisphere and apparently it was time to take on a new project. My friend Julie has been knitting throw rugs for her family for the last couple of years and finally convinced me to start one of my own. Now, for those who know me as the AntiCraft you will realize that this was no small undertaking on my part. Julie (being the good friend she is) lent me several balls of wool that matched the ones I bought - with these rugs it's all about lots of colour choice and lots of texture changes. I needed a box to put them in and we all know what boxes and balls of wool attract don't we? 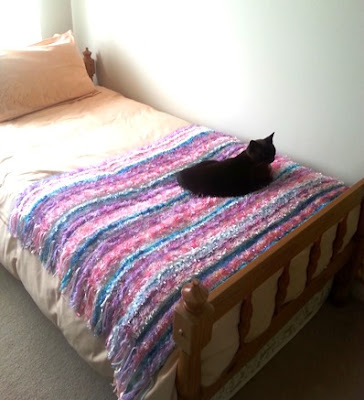 Yep, within an hour or so of bringing my wool home, I had first one, and then two cats trying it out for size. Fortunately the novelty has worn off and my wool is now living a peaceful life in its box and not being sat upon every five minutes. Then it was just a matter of casting on 170 stitches and trying not to drop any along the way! 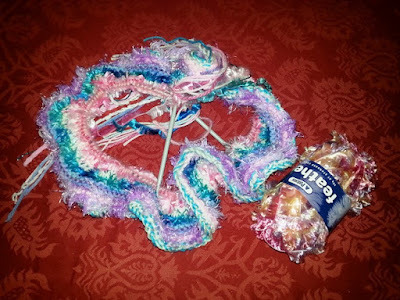 It was a bit disheartening at the beginning - lots of knitting and not much to show for it - and it tends to corkscrew around the needle cable and looks a bit like those curly fries you see at fairgrounds. I've been knitting away slowly but steadily and making a little progress each week. For a couple of weeks I stopped completely and had a rest from it - then back I went into making my rainbow/unicorn rug. I'm not really sure what I'll do with it when I finish, but that's a bit of a moot point at the moment because it is only about (maybe) halfway through. I have to confess to getting sidetracked when one of our TV stations streamed "The Handmaid's Tale". 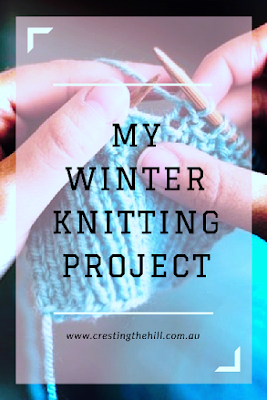 Ten one hour episodes of gripping, dystopian storytelling - I couldn't watch and knit at the same time because I was worried about missing something crucial. I've finished the series now and it will be a while before I find anything to replace it with so I'm back to steadily knitting away - I think I'll use it as a throw on the spare bed to brighten things up a bit. It's been a pleasant way to fill an hour or two here and there and it was nice to see that my knitting skills hadn't been completely lost due to lack of use! It was also a relief to know that I could do it with just good old plain knitting - if anyone had mentioned cable stitch it would have been over before it began. And the finished product still appeals to the cats! So, what are you doing hobby-wise to fill your time? Are you crafty, or a book reader, or are you getting sucked into a new TV series like I have been with "The Handmaid's Tale"? I'd love to hear about it in the comments below. I wish I had time to learn to knit. It looks so calming! My kind of knitting is very straightforward and simple - I always admire those women who produce cableknit sweaters while they watch TV! I love it! Great pictures too. What could be cozier than knitting in the winter, says the woman who doesn't knit.I committed to a having a booth with a friend who is real crafty and makes beautiful items for 3 shows starting in October. So besides enjoying and harvesting and producing from my garden and working I am in full production. Note to self, winter is the time to stock up on making crafts. I am making 3 items. Upcycled cowboy shirts to aprons, tooth fairy pillows and catnip sock cat toys. There is a magnetic bookmark I wanted to make but that is not going to happen. It's still summer in the US but I've started some projects. I finished a hat and scarf and am going to make some mittens to match! Good on you Rachee - I'm thinking that beanie knitting looks like fun - not sure my skills are up to mittens though! I am glad you have a winter hobby. I did some knitting last year which was incredibly labouring for me as I am not a knitter but I was determined to make a little blankie for a granddaughter's dolly. I actually hurt my shoulder (don't laugh) knitting so the physio said 'no more knitting for you!'. I tried crochet and I sucked so I will stick to my art! Thank you for linking up for #lifethisweek 29/52. Next week: Birth Order. It's a case of slow and steady for me Denyse - an inch at a time but I'm in no rush so that takes the pressure off. I tried crochet 100 years ago back in the dim dark past and haven't gone back to re-try it since. I hope you find the Handmaid's Tale Molly - it doesn't paint a pretty picture of the future, but it was really thought provoking and a little bit confronting too. A change from all the reality rubbish out there. I used to knit, and I have a very simple pattern for slippers. Every year I think about making them for my grandchildren, but then I remember how much time it takes and think, "I'll definitely get started early and do it next year." Your post reminds me that there are many hobbies I've not done for a few years; I'm thinking it would be nice to do some of them again. Your project is beautiful! I knitted slippers for my kids one Winter many moons ago Melody - they loved them but I've never done it again - maybe when the grandbaby gets a bit older? You made me laugh out loud with your referal to yourself as the anticraft. :) I have never learned to knit or crochet so I take my hat off to you for learning this craft. Thanks for sharing with us at #BloggingGrandmothersLinkParty. I’ve shared on social media. It's tough when you aren't skilled in all the craftiness that you see on the internet Clearissa - but we probably have mad skills in other areas to make up for it! 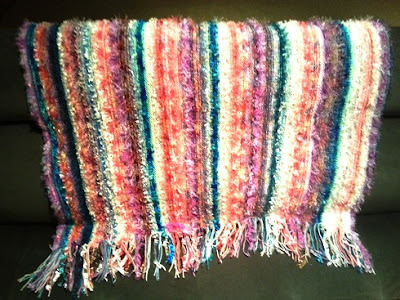 It's been years since I knitted anything, but I did enjoy it when I used to do it. 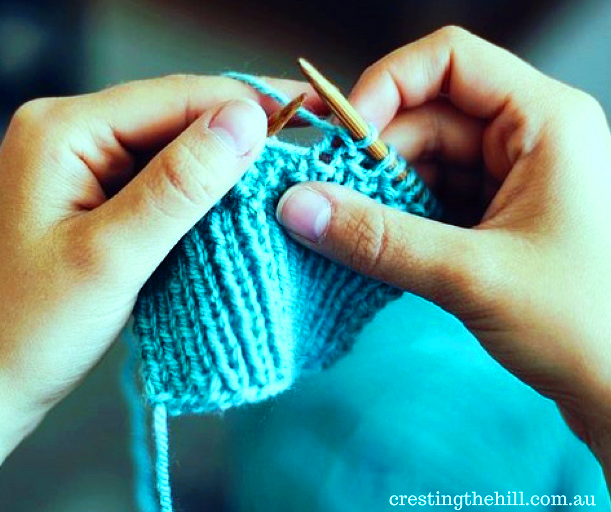 Knitting has a calming effect -- I think, due to it's repetitive nature. Thank you for linking up at #BloggingGrandmothersLinkParty. I’m sharing your link on social media. I've been knitting this year Leanne for the first time in many years. I have almost finished a jumper just the neck and sewing together. 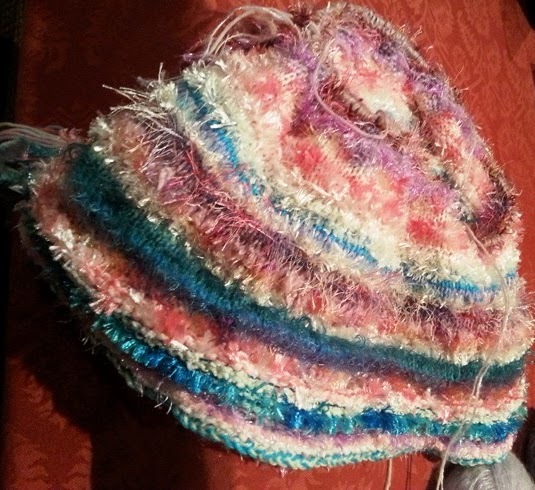 I love your project and the colours in the wool. Thanks for sharing with us at #BloggingGrandmothersLinkParty. Have a great week! Your projects are beautiful! I love the cats in the boxes! 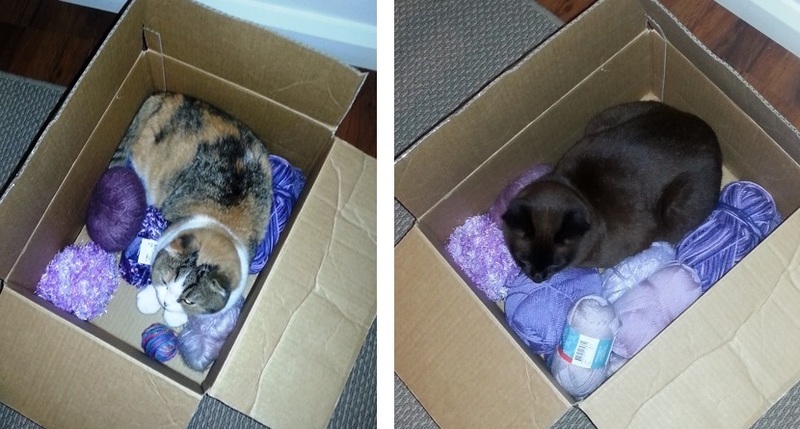 Thanks Lori - cats and boxes and wool are the perfect storm really aren't they? Looks nice! You did a good job on it! Wish I knew how to knit. 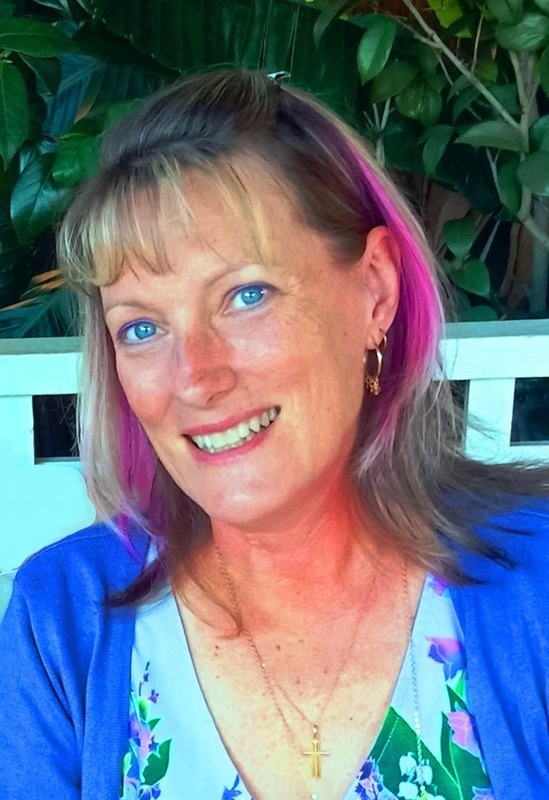 Thank you Leanne for linking up at the #BloggingGrandmothersLinkParty. I shared your post on Facebook, Google+, Pinterest, and Twitter. I learned to knit in high school and haven't touched it since, though I think I would like to someday. 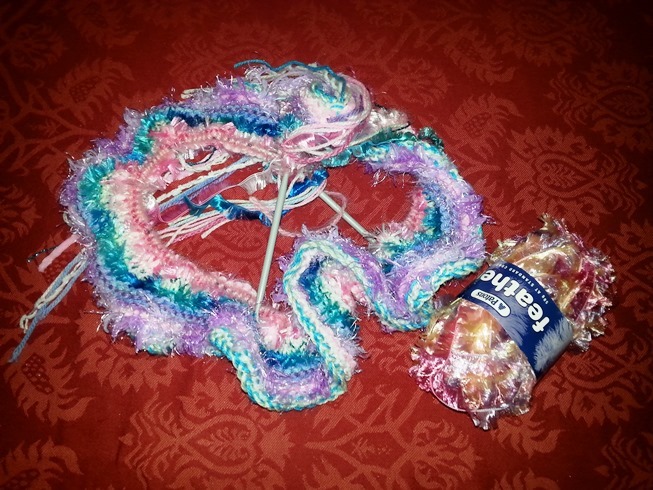 I do crochet occasionally and actually completed a mermaid tail for my granddaughter! My husband and I recently discovered the British series Death in Paradise and we are really enjoying catching up on those episodes on Netflix. Thank you for sharing on #BloggingGrandmothersLinkParty! Shared!